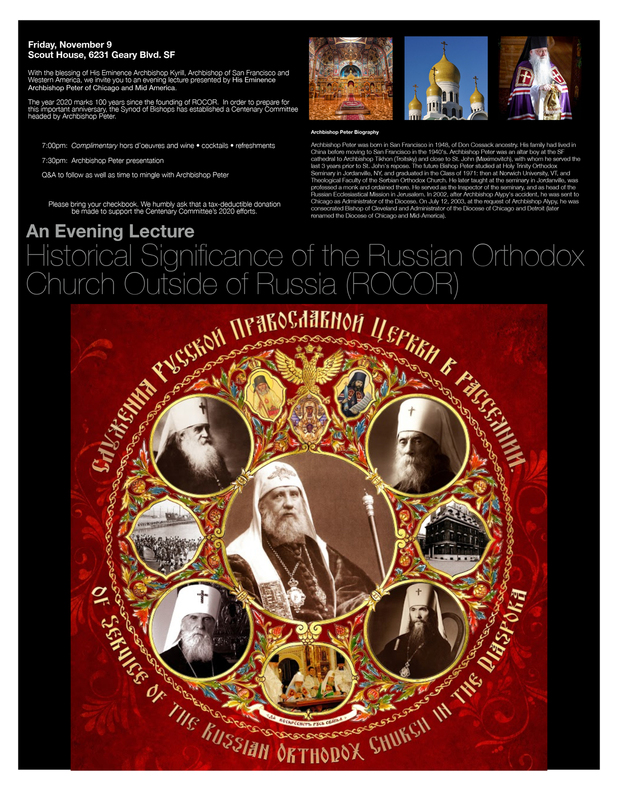 With the blessing of His Eminence Kyrill Archbishop of San Francisco and Western America an evening lecture (bi-lingual) will be presented by His Eminence Archbishop Peter of Chicago and Mid America. The year 2020 marks 100 years since the founding of ROCOR. In order to prepare for this important anniverary, the Synod of Bishops has established a Centenary Committee headed by Archbishop Peter. 7:00 PM Complimentary hors d'oeuvres and wine, cocktails, refresments. Please, bring your checkbook. We humbly request your tax-deductable donation in support of the 2020 Centenary Committee's efforts. Archbishop Peter (in the world, Paul A. Loukianoff) was born in San Francisco in 1948, of Don Cossack ancestry. His family had lived in China before moving to San Francisco in the 1940's. Archbishop Peter was an altar boy at the San Francisco cathedral to Archbishop Tikhon (Troitsky) and close to St. John (Maximovitch), with whom he served the last 3 years prior to St. John's repose. 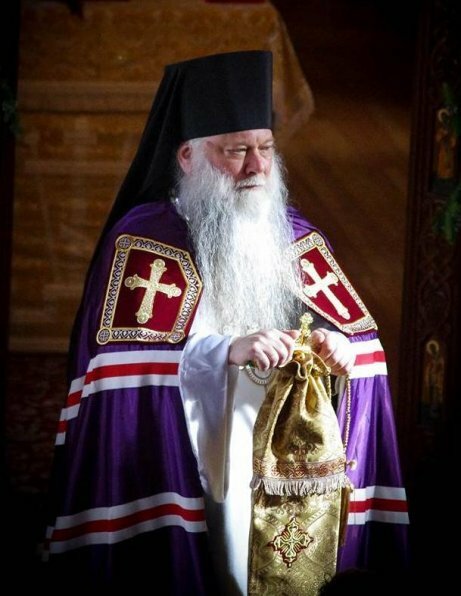 The future Bishop Peter studied at Holy Trinity Orthodox Seminary in Jordanville, NY, and graduated in the Class of 1971: then at Norwich University, VT, and Theological Faculty of the Serbian Orthodox Church. He later taught at the seminary in Jordanville, was professed a monk and ordained there. 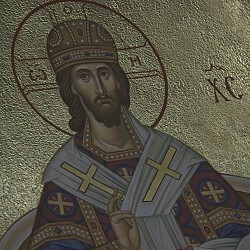 He served as the Inspector of the seminary, and as head of the Russian Ecclesiastical Mission in Jerusalem. In 2002, after Archbishop Alypy's accident, he was sent to Chicago as Administrator of the Diocese. On July 12, 2003, at the request of Archbishop Alypy, he was consecrated Bishop of Cleveland and Administrator of the Diocese of Chicago and Detroit (later renamed the Diocese of Chicago and Mid-America). At the Divine Liturgy commemorating the 50th anniversary of the blessed repose of the Holy Hierarch John of Shanghai & San Francisco on Saturday, July 2, 2016, His Grace Bishop Peter was commemorated for the first time as Archbishop and given the title of “Chicago & Mid-America”.